Jeri’s Organizing & Decluttering News: Get Your Free Valentine's Day Teddy Bear! 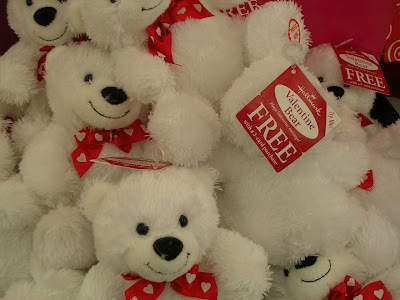 Get Your Free Valentine's Day Teddy Bear! "With those three greeting cards you get a free teddy bear," the cashier said to the woman ahead of me in line. And off she ran to bring the woman her bear. "Do you want a little teddy bear?" I asked the woman. "No, but I'll find someone to give it to," she said. Declining the gift never occurred to her. Maybe she'll give the bear to someone who couldn't afford to buy one - but maybe it will wind up being one more toy for some child who already has more than enough. And this is one way that we wind up with clutter. We agreed to refuse freebies like this when we moved into our RV. After three years, it is still hard to say No. I think that is partly because we are so strongly socialized to accept gifts graciously. When someone hands you a bear or a pen or a mug and you say you don't want it, they are shocked and we perceive that they are hurt. Even when they are simply doing their job and have no investment in the item! Interesting insight, Louise! Does the reaction vary at all in different parts of the country, or in different sorts of situations? This particular cashier was pleased when I declined the plastic bag for my two small items; she may have actually been intrigued by the idea of someone turning down a free gift. Jeri, I haven't noticed any difference regionally, but that's an interesting question. I'll have to pay more attention! But How Do I Store the Boots? IKEA: Love It or Hate It? Who Needs Another Coffee Mug? Pen? Free Calendar?